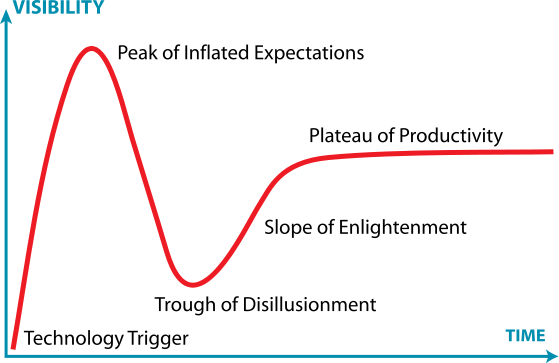 Fortunately, as we emerge from the peak, we’re now entering an era of Content Marketing Productivity. In short, Content Marketing will no longer be hailed for simply existing in a marketing plan — now it will be measured by its ability to “lock eyes” with B2B prospects as they research and make their decision. 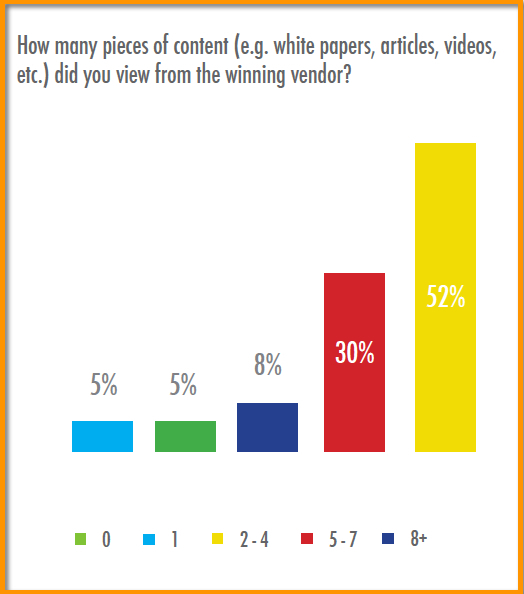 At the same time, respondents did not agree or disagree that their winning vendor produced more content during the purchasing process — a sign that the amount of distributed content isn’t as relevant as the quality. As for SEO and Google rankings? Well, Google spoke volumes about quality over quantity with its Penguin and Panda updates — continuing its firm move towards serving up quality search results for its visitors. During the Peak of Inflated Expectations, many companies expected that waving the “magic content wand” would force prospects to make their decisions faster — generating a flood of instant sales. In fact, 40% of survey respondents say they waited longer than last year to initiate contact with B2B vendors. Why? Perhaps because more than two thirds (68%) of respondents agreed that the number of content sources used to research and evaluate purchases has increased over the past year. 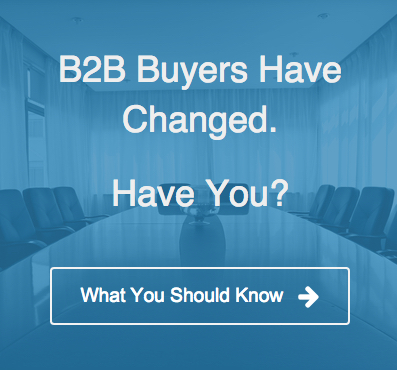 The Bottom Line: As with consumers, B2B buyers now have more information at their fingertips than ever before. They want to measure, learn and form an argument (make a case to their boss) before ever engaging with a vendor’s salesperson. It seems it’s more dire than ever for B2B players to play their part in meeting prospects with quality content. One could argue that content has actually extended the decision cycle — but has made prospects more confident and satisfied along the way. The evidence is clear that content marketing is becoming a standard for lead generation, lead nurturing and increased visibility online. But, now that the hype cycle is shifting, it’s important for you and your team to conduct a “gut check” of your content marketing motives. This doesn’t mean know their demographics or your typical target company size. You must dig deep into each decision maker, what makes them tick and what keeps them up at night. A word of warning: Don’t settle for superficial or half-hearted audience exploration or documentation. Exhaustive and detailed profiling of your audiences holds everyone accountable through every stage of the content marketing cycle — VPs, writers, strategists, distributors, designers…you name it. Every editorial and marketing decision should map back to your audience pain points and needs. Period. Do you truly understand every stage of research, questions and stumbling blocks that the buyer faces? The content you create to generate awareness will be very different than the content you deliver to help the buyers justify the purchase to their boss. How about after they become a customer? 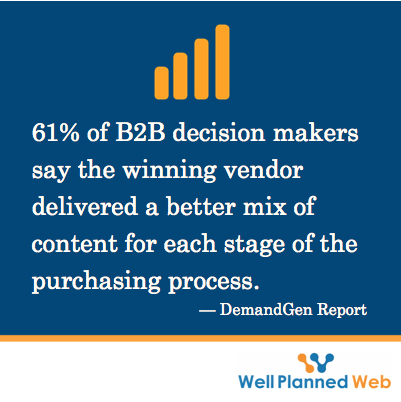 Are you generating meaningful content to retain their business or to get referrals? Diving into Content Marketing without a solid goal of locking eyes with your customer is like proposing marriage before you’ve ever dated. Recognize the difference between “good” content ideas and “Mission Critical” content — the content that’s bound to put you on the short list. 4. Drop the “Machine” Mentality. Dedicate budget and resources to quality content — not to a mindless machine that pumps out content for content sake. 5. Listen. Measure. Pay Attention. What content seems to perform best? This doesn’t always equal conversions. It can mean that content simply struck a chord and kept the eye-lock with customers as they researched. This is especially true for marketing automation and email content. Celebrate open rates — even if they don’t click through. It means they’re listening. Try sharing that same content in a LinkedIn group discussion. Take note. Create meaningful content in response to any push back, questions or doubts you encounter. “The content you create to generate awareness will be very different than the content you deliver to help the buyers justify the purchase to their boss.” This is a great piece of advice for anyone working in inbound marketing. Thanks a lot for the interesting article, I’ll definitely pay more attention to your must-do’s in the future. Standing fricken o-o-ohhhhvation Deanna. In fact, this is the best post I’ve read this year. Please make sure everyone in marketing reads it and goes away having learned that the content they create actually has to be valuable. “Drop the machine mentality” is a killer soundbite. D, D, D, D, D! (and the crow gets into it). Okay, clearly my Disqus notifications failed me, Barry. THANK YOU for the kind words! I was, indeed, pretty passionate about this one. Your comment just made my day. 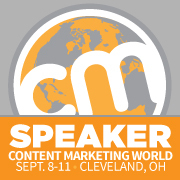 Will I see you next week at #cmworld! ?